For the last several years, we've thrown a holiday party in Texas–and one of the libations always on offer is a Chatham Artillery Punch. When I saw that it was served at Leanna and Sam's wedding, I thought it was high time we finally shared a favorite family recipe! 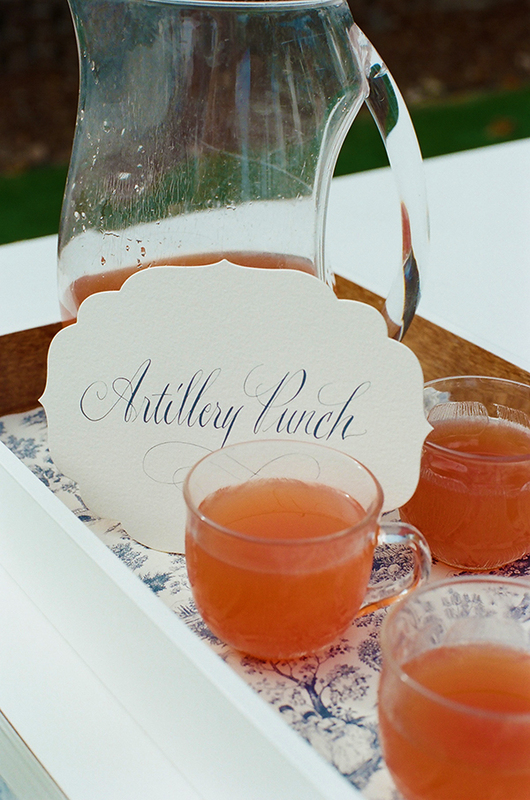 We first encountered Chatham Artillery Punch on a paper placemat at a restaurant in Savannah; the inauspicious introduction aside, this punch has become the centerpiece of our holiday celebration, but would be equally at home at a garden wedding or pool party–provided that you keep your guests away from the edge! Combine all ingredients in a punch bowl except Champagne. Let sit for thirty six to forty eight hours. Before serving, add chilled Champagne. Notes: There's a lot of liquor in a good Chatham Artillery Punch; with that in mind, each item doesn't need to be the highest quality for it to have maximum impact. Chose an inexpensive Rhône or Burgundy for the wine, and a domestic sparkler instead of Champagne, but do make sure your black tea is strong to cut through all the sweetness. And from personal experience, I recommend you limit yourself to just a glass or two–cheers! Image by Adrienne Page Photography. Yay! Cocktails are back. I miss these...good to know about a one glass consumption rule! Definitely a one glass rule, two glass max!